The 2014 edition of the popular Steam Heritage Guide will be available in mid-March, so don't miss out on planning those exciting holidays and days out. This year's Guide is the biggest ever as we have added another 16 pages of more places to visit, giving not only a record number of pages at 148, but a record 2,200 opportunities to enjoy our hobby. So, don't miss out on clearing away those winter blues and start planning where you are going to visit during the summer! And don't forget – the Steam Heritage Guide lasts for a year, with some attractions open all year and events up to Christmas and beyond. 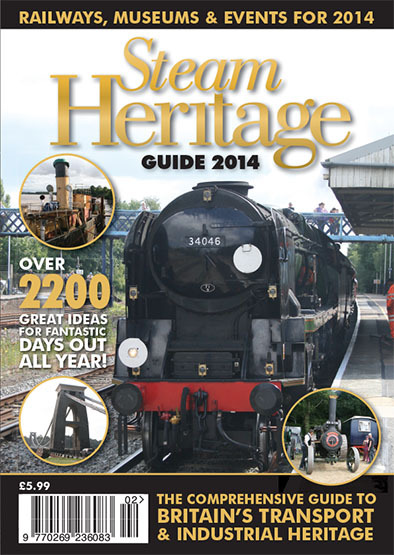 Next entry: 2014 Steam Heritage Guide at the printers!